Back and Forth. In a game of ever changing momentum, sometimes it is the unlikely heroes that step up to the plate. Tonight, those heroes were Bryan Lerg and Chris Collins. Lerg had 2 goals and Collins had one of his own to lead the Pens to a 4-4 tie which they would break with a shootout victory. After Nick Palmieri got a rare 1st goal vs WBS, it was a familiar hero who was there to tie it up. Eric Tangradi pushed the puck past Devils netminder Jeff Frazee to tie the game up at 1 and pick up his 13th of the season. But Albany responded 3 minutes later with a Rob Davidson shot that beat Theissen. But...Bryan Lerg responded 1 1/2 minutes after that with a goal of his own to tie the game back up at 2. Lots of momentum shifts and lead changes makes for an interesting period, and the 2nd would be more of the same. Chris Collins struck first for the Pens at 5:18, but of course Albany responded a few minutes later with a Michael Swift powerplay goal. Lerg notched his 2nd of the game less than a minute later to put the Pens up 4-3, and then the goalies took over for a while. WBS registered 15 shots in the 2nd and Albany got 13 so it would be an understatement to say that Theissen and Frazee got a bit of a workout. Things calmed down a bit in the 3rd, but Albany still managed to tie it up when Dan Kelly scored his first goal of the year. Overtime was full of Pens' opportunites, but they just could not cash in during the short 5 minutes span. A shootout would be necessary. Dustin Jeffrey was unable to cash in for the Pens, but then the flood gates opened when Nick Johnson, Kevin Veilleux, and finally Brett Sterling were able to beat Frazee and clinch the win for the Pens. Theissen was perfect on the other end. 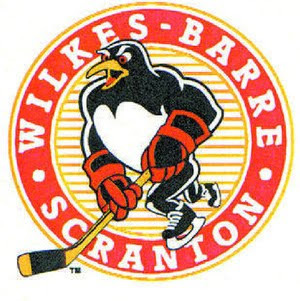 WBS can take the week off (although they might need it to travel in the snow) before they hit the Consol Energy Center on Thursday to take on their hated rivals from Hershey. If you are a serious fan here in WBS, you may probably already be going to this game. If you are from Pittsburgh and don't know much about WBS, you should really consider it because these games are always entertaining. Plus, it will be sort of a JV game to the Winter Classic featuring the Pens and Caps AHL affiliates. Let's Go Pens!